Last edited by IndyCal; 03-03-2019 at 03:31 PM..
That rust is minor easily corrected, 48k for an 87 seems a bit high in this market seems around 40 is more like it. Depending on the car. Thank you guys, for the insights and advice! Just curious...Did the ppi come up with any additional rust issues? 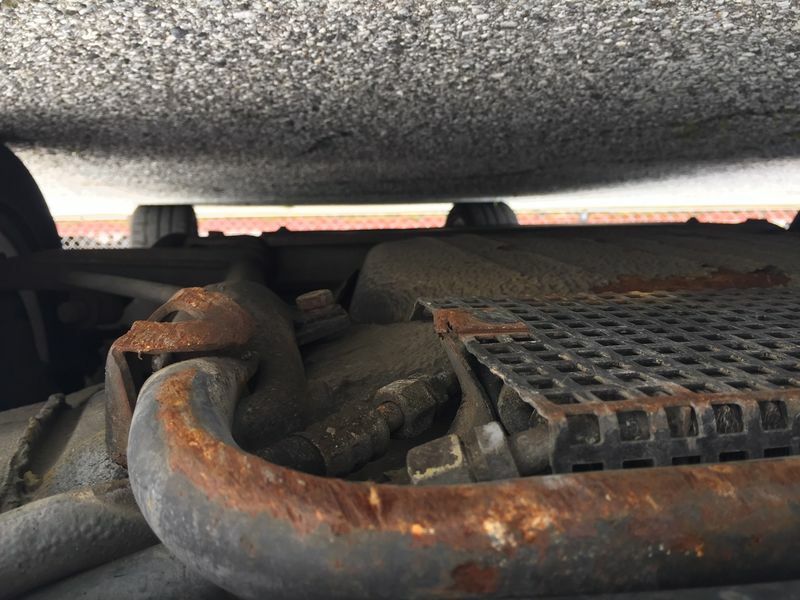 No body rust; surface rust on exhaust, heater box and some underbody bolts. To be expected i guess...good luck going forward..
Its interesting that the car had a windows out repaint at that low of mileage. Was the color changed? Seller reports same-color repaint was to address sun damage. The 'crash bar' did its job. It's a sacrificial part. The protective cage over the condenser is inexpensively replaced. Nothing to be concerned about in what you've shared, but pics of the pan under the bar and rocker area and other rust-vulnerable spots need looking at. 911s from 77 on were galvanized and resisant to rust but not invulnerable. As others have said the rust on the parts showing is nothing. You could remove those parts, clean and paint them in an afternoon. They did exactly what they were supposed to do. $48k for a G50 car with 73k miles might be a decent deal. Is it a coupe, cab or Targa? What color is it? Is that the original color? How good a job was the new paint job? Is there any history on the car, recent and past service paperwork? What are the rest of the cosmetics like? Did you get any leak down or compression numbers from the PPI? How do you think the valve guides are? Any history of oil consumption? There are more questions too. I am not sure how anyone can say whether its a good deal or not without knowing most if not all of that info? Seriously the price variance between a coupe, cab and targa is pretty significant.